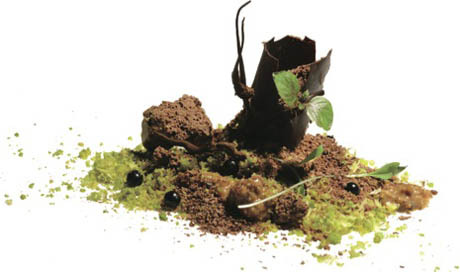 IMAGE: Albert Adrià’s falling chocolate trunk filled with frozen chocolate powder, on a forest floor of lime-and-mint yogurt, with almond praline, puffed quinoa, and green-pistachio streusel, via. In this week’s New Yorker, Adam Gopnik has a lovely article about dessert. Writing as a lifelong dessert lover coming out of a year-long dessert-free diet, he finds a course in crisis. Without surrendering sugar, dessert had surrendered all its familiar forms—the cake, the soufflé, the pudding—as the avant-garde novel had surrendered narrative, character, and moral. Losing our faith in art is, in a secular culture, what losing our faith in God was to a religious one; God only knows what losing our faith in desserts must be. Gopnik skates over a quick history lesson, in which the primate instinct for sweetness meets the West Indies sugar plantation in the late seventeenth century. The ensuring “cheap-sugar revolution” simply spawned a nation of sweet tea drinkers in England, but inspired a “full-blown dessert cuisine” in France, whose culinary traditions then went on to become the fine dining template for the Western world. 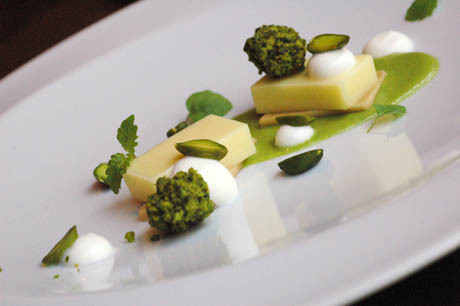 IMAGE: Yuzu curd, shortbread, spruce yogurt, and pistachio, dessert by Alex Stupak. Photo by Antoinette Bruno. Like dessert itself, the rest of the eight-page article provides little in the way of substantial answers, but much in the way of frivolous enjoyment. 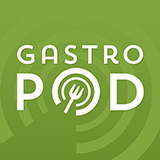 Gopnik talks with Alex Stupak, pastry chef at Wylie Dufresne’s WD-40, Jordi Butrón of Barcelona’s Espai-Sucre (“a working research laboratory and school, where new desserts are regularly conceived and experiments made”), Ferran and Albert Adrià of the now-shuttered elBulli, and “the young Mozart of pastry,” Jordi Roca, of another Catalonian temple to molecular gastronomy, El Celler de Can Roca. Desserts are naturally denatured food. Birthday cake is the most denatured thing on earth. 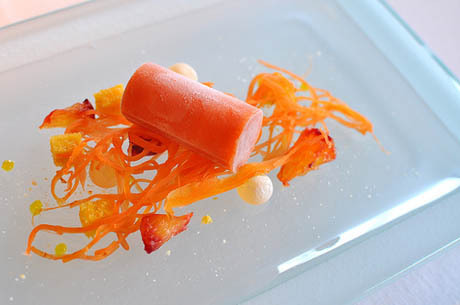 IMAGE: Orange colourology by Jordi Roca, via. That was something that hadn’t really been realised enough in desserts, I thought: the power of aromas. I went to Sephora and found the most wonderful aromas in all the women’s perfumes. And I started making desserts built around their smells. IMAGE: Trésor by Lancôme, by Jordi Roca, via. 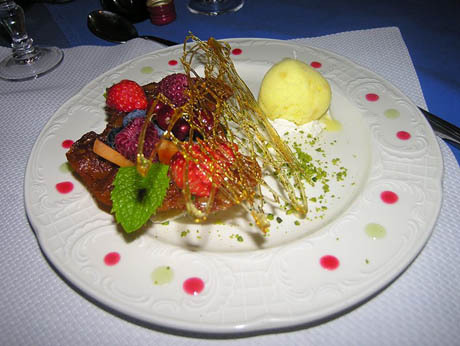 IMAGE: Dessert, as visualised by Wikipedia. Interestingly, in a crowd-sourced complement to the epistemological crisis of the New Yorker’s avant-garde techno-emotional pastry chefs, Wikipedia’s dessert page is a inadequate and hotly contested stub. Clinging onto the weak assertions that dessert “usually” consists of sweet food, “typically” comes at the end of the meal, and is “often” eaten with a dessert spoon, the definition quickly fizzles out into a necessarily incomplete list of possible dessert dishes and a half-hearted admission of dessert’s essential superfluity (“Elimination of dessert foods may be a strategy used in dieting.”). Over at the associated editing page, conversation is heated, with comments such as “Pudding is not a dessert,” “I don’t think that “Dessert” really belongs in the “Meal” series,” and “WHY DOES AS IMPORTANT A THING AS DESSERT GET SUCH A STUB AS THIS! 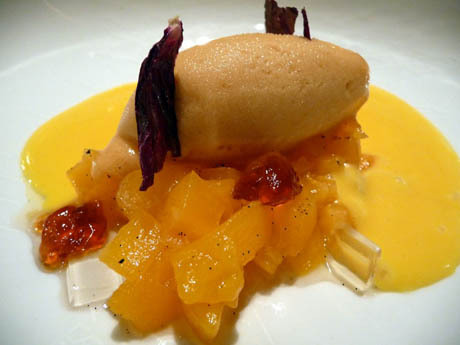 !” Class conflict even rears its ugly head, with some claiming that the exemplary dessert photo is “upper-class bias, people!” while others quibble that the very word “dessert” is elitist. In its own way, dessert seems to me to be the poetry of food: elusive except by self-definition, best in small servings, and with a tendency to abstraction, it is easily dispensed with altogether, but also has the power to evoke sensation and emotion like no other form. At the very least, it’s a fun excuse to order it more often in 2011. I really like the thoughts about wikipedia. Whats the point of telling us what we already know about desserts. A definition of something should be illuminating and accurate. Not stereotypical. Should we, as a society support something that is well crafted, but elitist. Is something elitist because its expensive? Yes. It lacks access. Accessibility in my opinion should be something that we are including in our framework for creation. As an visual artist, I am constantly considering this. 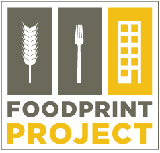 I think making good decisions about food is as much about creating food trends, than it is about innovation in terms of creation. I guess the question here is, does good innovation reside in expertise and client relations or does it relate to our decisions about where, how much and in which manner. Well, first off, I personally would absolutely order the desserts pictured above. Also, I think it’s important not to dismiss them out of hand because they are foreign, both in presentation and flavor construction. But I do think these two comments are interesting, though I wish they would have been elaborated on a little more. The discussion of dessert fascinates me. As someone who likes to cook and who rarely craves sweets, I am nonetheless drawn to making desserts. I may crave a piece of fish or some vegetables or meat more than I crave a fancy sweet, but I’m more fascinated with the process of making sweets. It’s a fussy, scientific endeavor to create something that not only satisfies a primal craving for sugar, but also the desire for beautiful, precious things. As a poet, your analogy to poetry seems apt. I fuss over just the right word in poetry, as I fuss over just the right custard in making desserts. And much like poetry, there seems to be a fading place for beautiful desserts in American society. But the question of why we would prefer a simple scoop of vanilla ice cream and a chocolate chip cookie over the elaborate labors of love above is one that could be further elucidated. In our culture I think we have a sort of aversion to dessert. We are used to cheap sugary sweets as children, and as adults we are made to fear the consequences of dessert to our figures. Perhaps since we view dessert as an evil temptation to begin with, we see artful dishes and regard them with distrust. I don’t know. The class line is an interesting, and probably accurate criticism also, as is the idea of dessert being denatured food. Lots of interesting stuff to think about here.